Modern Metronome iPhone and Apple Watch App - Moving Average Inc.
An elegant and accessible musical time keeper with visual feedback and only one setting: the tempo. You need an easy way to practice music apart from your band or orchestra. No setup is required to get a beat. Start the app and the beat begins. To set the tempo, you pull the slider to the tempo required for your practice. You can easily match the tempo of a recording by moving the slider until you find the exact tempo. 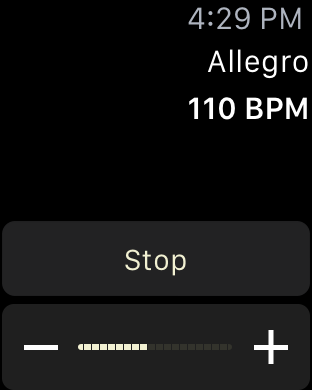 You can also match a tempo by tapping the rhythm on the upper half of the screen. You control the volume with the physical buttons on the side of your device. The timing continues even if you switch apps. You can stop the timing at any time from Control Center, the app itself, or from your Apple Watch. To make it easier to position your device on your piano or music stand, Modern Metronome works upright or with your device on its side. 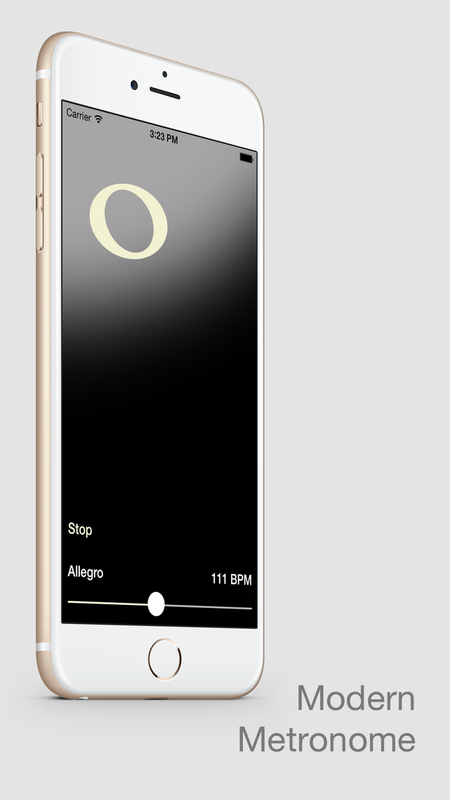 Modern Metronome on the iPhone can be controlled with the bundled Apple Watch app. It allows you to start and stop the metronome, and also increase or decrease the tempo from your wrist. Because Modern Metronome has accessibility features and is available through institutional purchase programs, it's a great solution for the classroom. There are no special modes for students to get confused by, and just one standard slider control for adjusting the tempo between 20 and 220 beats per minute. Modern Metronome integrates with VoiceOver to assist users with visual or physical disabilities. It also supports the complete range of dynamic text sizes selectable in the Settings app.